This was a collaborative piece done with the awesome Melissa Dow! We each gave each other a prompt or description of what we wanted to paint. 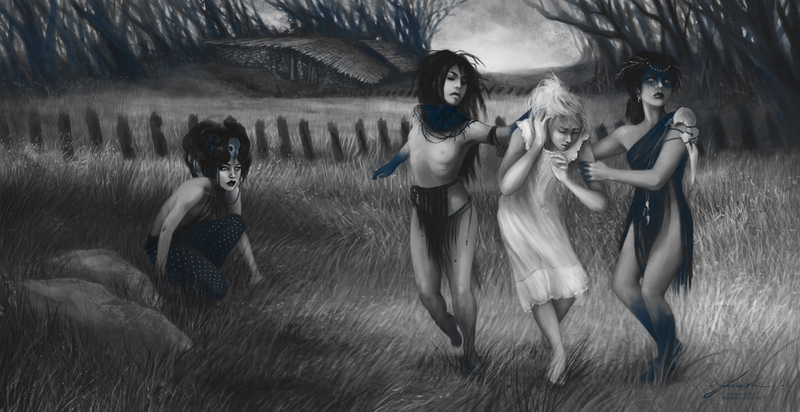 I gave her the description of three wild children, changelings, taking another child. I wanted there to be a sense of a rural landscape and for it to have an ominous feeling to it. She gave me this beautiful line-work for the composition which I then used to do a painting from. I absolutely love the composition and design and I had so much fun bringing it to life! I really felt like she captured the scene I had in my mind really well and this is one of my favorite pieces I've done to date!